Have you thought about that recently? In this digital age where it seems like so many lives are not really lived amongst and around us, but are just snippets of social media strung together- why do we still take pictures? Are we trying to impress, are we trying to avoid, are we trying to remember? Your pictures may never win a prize in a photography contest, but they are still yours. We take pictures to tell a story - either to share with others, or just to remind ourselves of our stories - of our lives. Your picture tells your story. But - unless you tell me more about it, I may not understand why you took that picture, what story you wanted to remember, what feeling you were trying to capture. Tell me why you took that photo where the ice cream is dripping down the side of the cone, or the one where your dog is buried in soap bubbles. Tell me about that sparkle in your Grandma's eye, or the look of concentration on the face of your five year old. I really enjoy taking photographs, even more, I like printing the good ones out and framing them! Ha! But, I do not tell the stories behind the photos often enough. So from now on, I'll be going back through old photos and telling you some stories. Some may be funny, some sad, but they will let you in on a piece of my life, and maybe they will inspire you to share the stories behind your own photos with those around you. We were made to belong to communities, to fellowship with other people, to feel. Stories let us do that. Let us embrace that humanness of our lives where we share stories again, where we linger to finish a conversation instead of hurrying from one moment to the next. Let's decide to live again - a deep, meaningful life lived with other people where stories help us connect, where the story of your life intersects with my story. Your photos may be blurry or crooked, but they are yours. 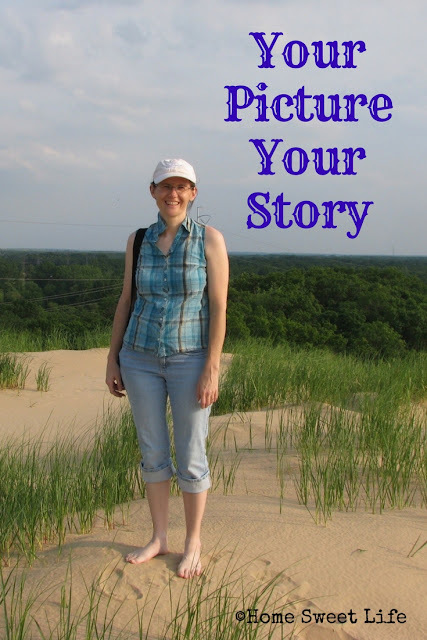 Find one of your pictures, and tell your story! Kurt took this picture of me several years ago - it was 2011. We had taken a trip for our anniversary, the first time we had done that since our honeymoon 17 years before. We had left the girls at my mom's house for the weekend, and we were going to spend 48 hours away. We had decided to go to the Indiana Dunes on Lake Michigan. Neither of us had been before, weird - since I had spent my life living in Indiana, that I had never been. But - it was a beach, and we wanted to go to a beach - and the Indiana Lakeshore wasthe only one close enough to drive to. This picture is of me standing on the top of Mount Baldy, one of the large sand dunes. I had climbed a mountain - well, not really, but at 120+ feet tall, climbing to the top of Mount Baldy was a serious hike! I had made it, and I stopped taking pictures long enough for Kurt to snap this picture of me to show the girls that Mama had climbed all the way up by herself! This picture will never win a photography contest, yet it reminds me of an adventure we had. It reminds me of the next trip we took to the Dunes - when we took the girls with us, and we climbed up together. And now, it reminds me that you can only take a hike up Mount Baldy if you join a guided tour with a ranger, because Mount Baldy has developed some pretty scary holes - probably brought on by rotting trees that the shifting sands have buried over the past 80 years. So now visitors climb other dunes, and appreciate Mount Baldy from the shoreline trail. Today - this picture reminds me that mountains can be conquered, and I can be the conquerer!